↑ "Promises Delivered! Gujarat Cabinet approves creation of 7 New Districts and 22 New Talukas". नरेन्द्र मोदी. 25 January 2013. मूल से 15 April 2015 को पुरालेखित. 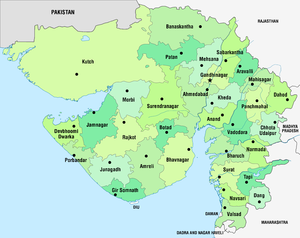 ↑ "Maps of Gujarat's new 7 districts and changes in existing districts". Desh Gujarat. 13 August 2013. मूल से 16 August 2013 को पुरालेखित.